Are you planning to visit Singapore with your partner on a holiday soon? Is their an anniversary coming up? Singapore has plenty of tourist places and attractions to spend a romantic time, but it can be difficult to choose with so many fun options on offer. 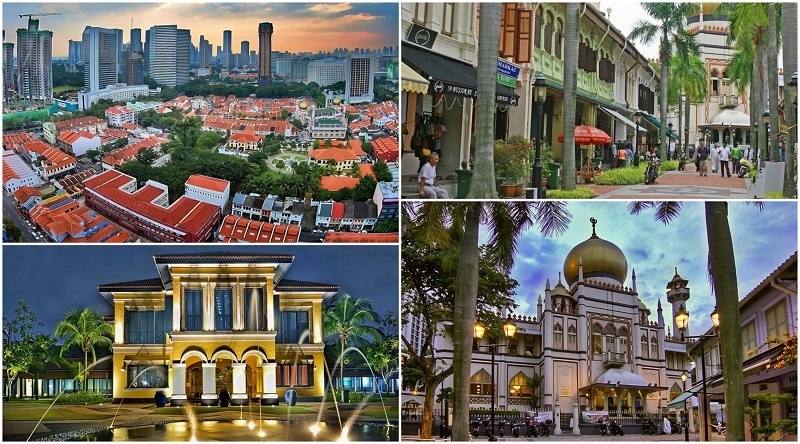 Here are the 27 best tourist places to visit in Singapore on your next trip. No trip to any city is complete without getting a good view of its skyline. At the Singapore Flyer you can do just that – It takes you 165 meters above the ground, higher than any Ferris wheel in Asia. Once you get to the top, look for iconic Singaporean landmarks such as Gardens by the Bay and Marina Bay Sands. On a good day you can even see as far as Indonesia. The Singapore Flyer combines brilliant views of the city with world-class services for a luxurious ride into the sky, perfect for any romantic date. 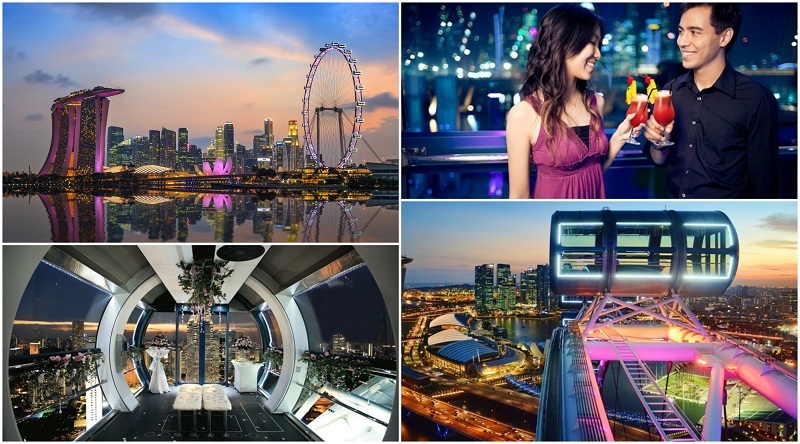 How can you take your experience at Singapore Flyer to the next level? Get the VIP treatment – Singapore Flyer offers extravagant experiences in their cars. These rides, or “flights,” come with a fine dining or champagne option. Whether you want to spend a special night with a loved one or your group just wants to treat themselves, Singapore Flyer has you covered. Try the ultimate Singaporean experience – If you are one to stick with a theme, you won’t want to skip the Singapore Sling Flight. Sip on a Singapore Sling, the classic Singaporean cocktail, while looking over the city itself. Take the guided tour – If you prefer a more interactive experience, try the FLYER 360+. A multimedia presentation will accompany you on your ride to bring you up to date on Singapore’s history and culture. Of course, your digital guide will point out the city’s famous landmarks. Gardens by the Bay is a collection of gardens, greenhouses, and buildings located in Singapore’s marina. The park has won several awards for its designs. In addition, Gardens by the bay is known for its beautiful composition of flora and fauna. With its inventive architecture, exquisite arrangement of its gardens, and impeccable cleanliness, Gardens by the Bay is one of the best places to visit in Singapore for couples. 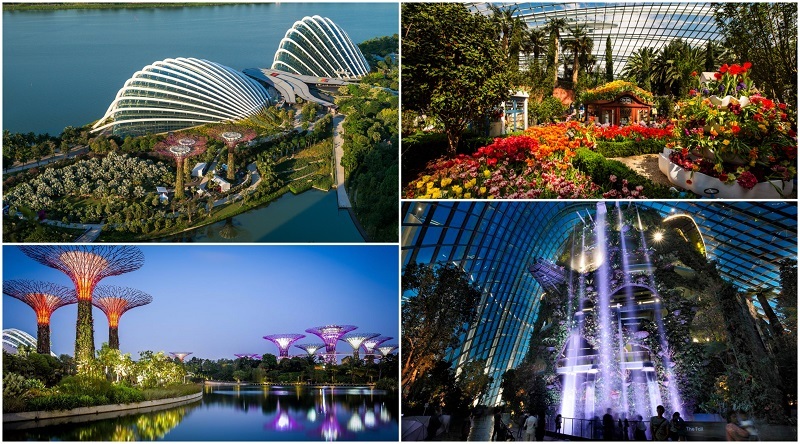 What are the must-see attractions at Gardens by the Bay? The Supertree Grove and OCBC Skyway – The glowing giants known as “supertrees” are actually vertical gardens. They are most beautiful at night, when they light up in an almost fairy-like fashion. The OCBC Skyway takes you into the canopy of this Supertree Grove and gives you a fantastic view of the surrounding gardens. Cloud Forest – The cloud forest is a greenhouse that recreates cool tropical mountain environments using air conditioning and jet vapor. Ascend the 42-meter tall “Cloud Mountain” by elevator and meander down the winding path, which takes you through the verdure. Flower Dome – In contrast to Cloud Forest, Flower Dome replicates warm Mediterranean and semi-arid climates. Marvel at the strange-looking plants from exotic places or the bright colors of the flower field. 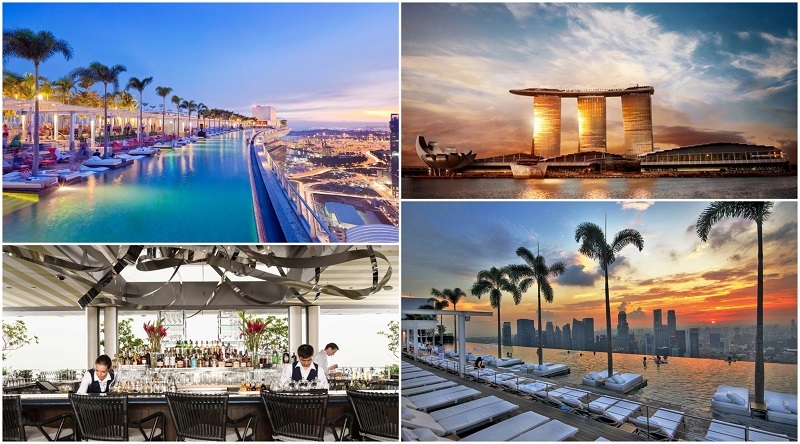 Sand Skypark Infinity Pool is the iconic pool that sits atop the Marina Bay Sands. Spend a day lounging on this luxurious rooftop or take a dip in one of the world’s most famous pools. The glassy water stretches towards the horizon as the city’s skyscrapers glimmer in the distance. This is a perfect romantic date for couples who prefer to relax. What should you know about Sand Skypark Infinity Pool? The pool leans over the edge of a skyscraper – This pool is an infinity pool, which means that it appears to have no boundaries, and it is 200 meters aboveground. The visual effect truly gives the impression that anyone standing close to the edge will fall. Stay away from the edge of the pool if you are prone to vertigo. Light refreshments are available – Don’t worry if you forgot your snacks on the ground floor – food and drinks are available during the day. If you are hungry for a full-course meal, you’ll find an abundance of choices just a few floors below. The Skypark provides poolside necessities – As is the case with many hotels, pool staff provides towels for use. Additionally, you can find items like sunscreen, sunglasses, and swimwear at the nearby Skypark Shop. ArtScience Musuem is another first-of-its-kind museum that integrates art, science, technology, media, and design. The museum tells stories of curiosity, inspiration, and expression through their permanent and rotating exhibitions. Whether your interests lie in the arts or sciences, couples are bound to find something fascinating at ArtScience Museum. 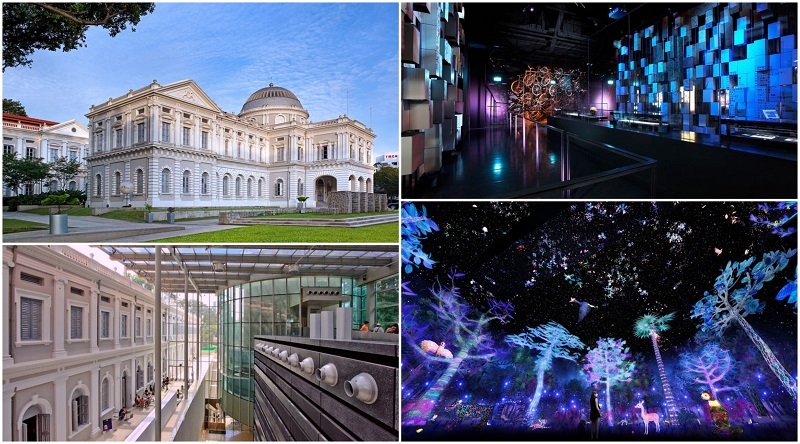 What does the ArtScience Museum offer to visitors? 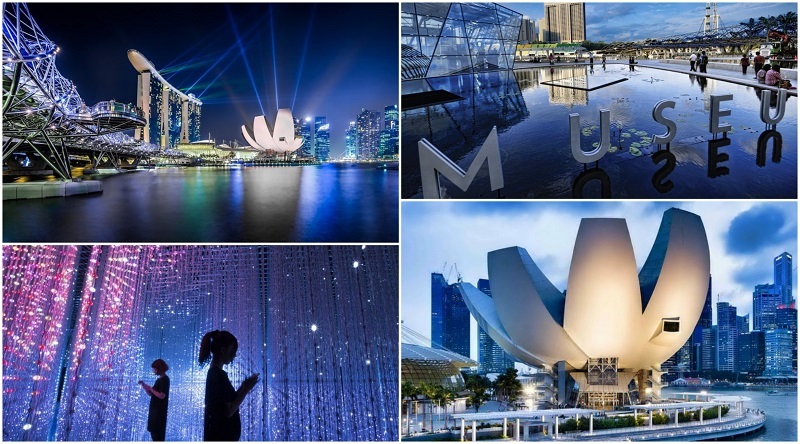 Nighttime exhibitions – On the third Thursday of every month, ArtScience Museum stays open past its regular hours until 10pm. These events, dubbed ArtScience Late, gives visitors an exclusive look at the museum’s subjects after hours. Special events and performances are also held at ArtScience Late. Film screenings – ArtScience On Screen is the museum’s impressive film program. It is committed to educate through film. Both local and international films are shown, with films rotating fairly frequently. Educational workshops – ArtScience Museum hosts many inspiring workshops and provide great opportunities for couples to spend time together. Fort Canning Park is a historical landmark and park located on Fort Canning Hill. It is a popular romantic spot for couples and is often used for various outdoor events. Relics from as early as the 14th century and historical monuments shrouded in greenery make for a mystical walk through the grounds. You’ll get a dose of both heritage and nature at Fort Canning Park. 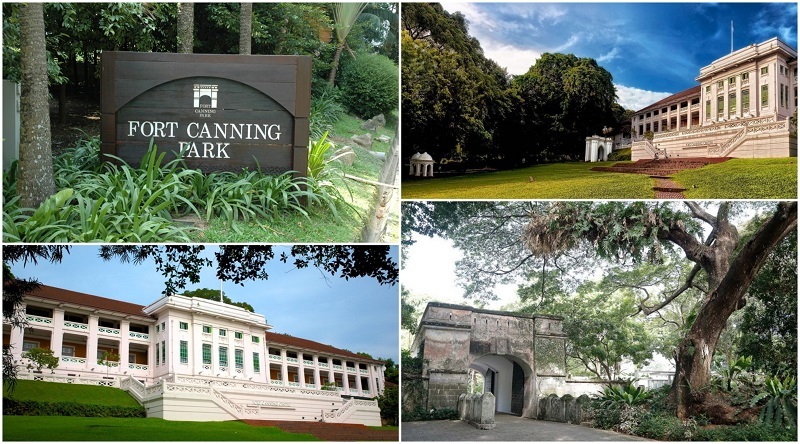 What is the history of Fort Canning Park? It was once home to royalty – Archaeologists believe that Fort Canning Park and its surrounding areas played a central role in the Kingdom of Singapura, the ancient predecessor to modern Singapore. The ruins and artifacts found here suggest that a palace once stood on the hill. Singapore was surrendered to the Japanese here – The decision to surrender Singapore to Japanese troops was made here, in the Fort Canning Bunker. This bunker, popularly referred to as the “Battle Box,” has since been transformed into a museum. Head to the Battle Box to learn more about Fort Canning Park’s complex history. 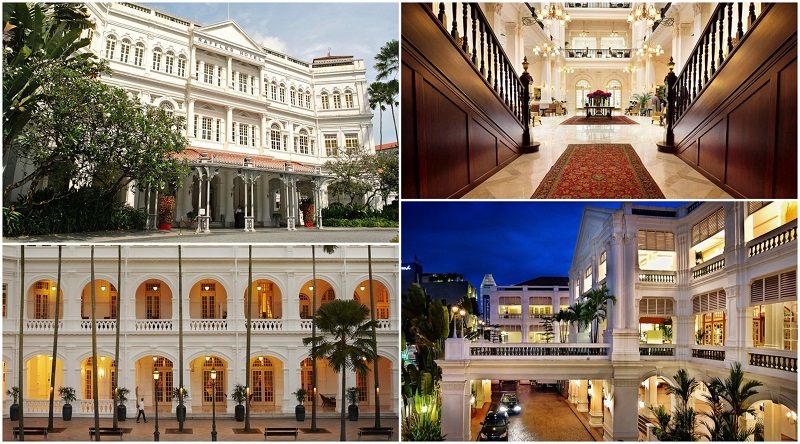 Named after the founder of Singapore, Raffles Hotel exudes elegant extravagance. As one of the few remaining 19th century hotels, it is steeped in tradition and history. Stay in one of the lavish romantic British-style rooms and enjoy top-notch service from hotel staff. Between its stylish architecture, delicate cuisine, and plush atmosphere, Raffles Hotel will have you feeling like royalty. What are some of the most charming aspects of Raffles Hotel? It is the birthplace of the Singapore Sling – The original Singapore Sling is served at the Raffles Hotel. The drink is famous for its mysterious recipe – since the original recipe was passed on through word of mouth, very few people have actually tasted a real Singapore Sling. Sip on the original drink at Raffles Hotel. Its colonial architecture – The colonial architecture of the hotel will have you thinking you were transported back in time. Meanwhile, the ivory and cream hues of the building’s interior pair with graceful arches to create a regal atmosphere. Luxurious amenities – Spoil yourself with the amenities available at Raffles Hotel. Luxuries here include a rooftop pool, steam room, and spa. Singapore as we know it is a fairly new state. Before the country was founded in 1965, it went through a series of occupations and transitions. With such a complex history it is only natural that the National Museum of Singapore is rich in interesting and insightful exhibits. Couples can discover how this incredibly diverse nation came to be through thoughtfully curated galleries and events. What aspects of Singaporean history can couples learn about at the National Museum of Singapore? Self – expression in the 70s and 80s – Learn about how Singaporeans came to assert their identity in the late 20th century, less than a decade since the nation was founded. This collection showcases works of music, television, and theatre that exemplify Singaporean self-expression. Singapore’s beginnings – This exhibit delves into the experience of childhood in Singapore during the 1950s and 1960s. It was a period of momentous change as the country struggled to establish a national identity. Here you will find installations and displays dedicated to understanding the complexities of growing up in the midst of such a turbulent transition. Japanese occupation – “Surviving Syonan” commemorates the resilience and hope of the Singaporean people during the Japanese Occupation. Here you will find items and stories from those who survived this time of oppression. Women throughout Singaporean history – This gallery focuses on the role which women, particularly Chinese women, played in Singapore during the 1920s and 1930s. Discover how immigrant women during this time established their identities through a collection of delicate items and belongings. 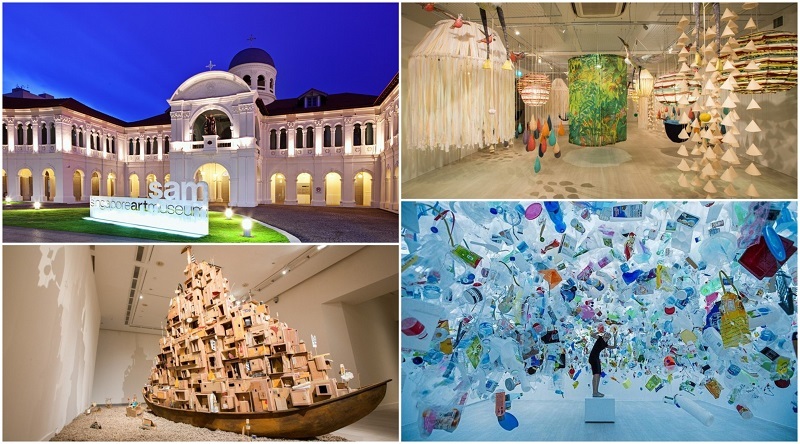 While the National Museum of Singapore focuses on the history of Singapore, Singapore Art Museum celebrates its contemporary art. The exhibits here celebrate innovative and reflective pieces by artists from Singapore and beyond. The pieces on display at the Singapore Art Museum will bring about an appreciation of the diverse and multiplex world of modern Southeast Asian art. What kind of exhibits can couples see at the Singapore Art Museum? Focus on Southeast Asian art – Singapore Art Museum tells the experience of artists from Singapore and surrounding countries. Pieces are diverse and include paintings, photography, architecture and design. Regular talks from local artists provide a space for discussion and understanding. Family friendly exhibits – The museum keeps children in mind with “Children’s Season Singapore.” This program works to provide enriching learning experiences for visitors of all ages. 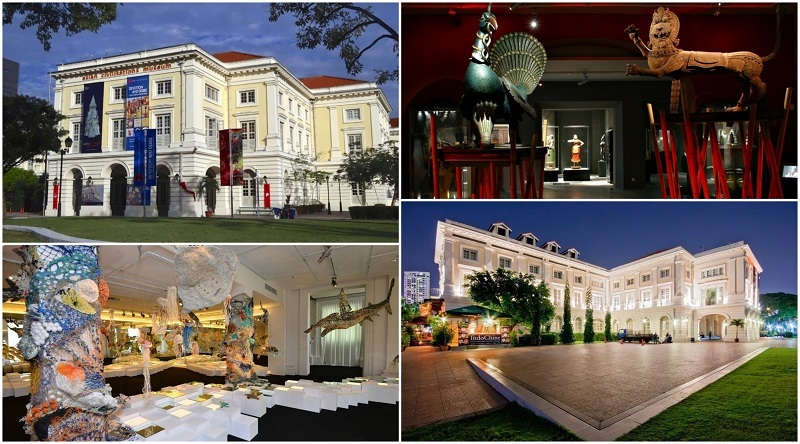 In addition, Singapore Art Museum provides education and outreach programs to accompany its exhibits. Promotion of a better future for all – Singapore Art Museum hopes to contribute to a more peaceful future by promoting tolerance and awareness. Collections often explore concepts of identity, conflict, and struggle. Galleries also encourage analytical thinking among visitors. National Gallery Singapore is an art museum located in downtown Singapore. With at least 8,000 works of modern art, it boasts the largest collection of Southeast Asian contemporary pieces. It is also the largest museum in the country so couples will have plenty of time to appreciate a variety of exhibits. Visit the grandiose National Gallery Singapore and see rows upon rows of modern art, all created by Southeast Asian artists. 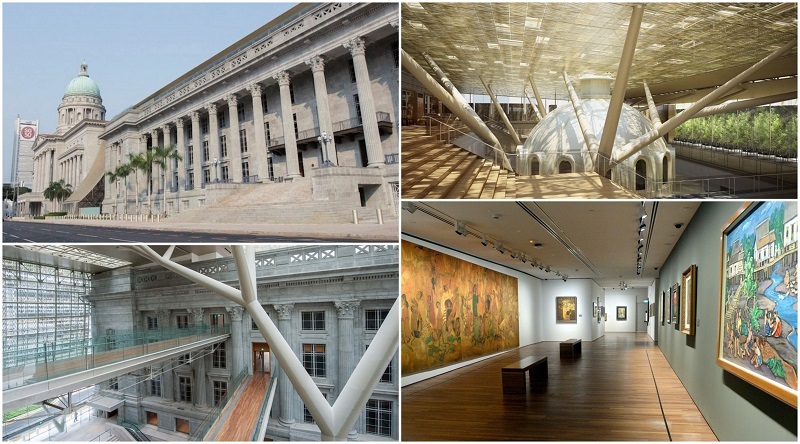 What are some things to consider when visiting the National Gallery Singapore? Museum tours – With a floor area of 64,000 square meters and thousands of works of art, this museum is no joke. If you find the gallery’s huge collection a bit overwhelming, consider taking one of the museum’s daily tours. Each tour has its own theme – architecture or museum highlights, for instance – so find one that interests you. Look for special programs – In addition to an expansive selection of artwork, National Gallery Singapore regularly hosts special events. These experiences include participating in a tea ceremony or watching animations come to life at your fingertips. Keep an eye out for special events on the museum’s website. Taking photos – There’ll be plenty of opportunities to take photos with you partner, but there are some exhibitions that prohibit photography. The Asian Civilisations Museum is a great place to visit for couples interested in the diverse heritage of Singapore. Through the exploration of artifacts from different Asian countries, the museum connects the people of Singapore to their ancestors. The history of Singapore’s unique ancestry unravels as you admire ancient works of art. What exhibits are showcased at the Asian Civilisations Museum? Tang shipwreck – Among the most popular exhibits at this museum is the Tang Shipwreck. This collection showcases ceramic, gold, and silver pieces found in the wreckage of a Chinese ship. Maritime trade and court – This exhibit explores Singapore’s role as a major trading hub in ancient times. Pieces here suggest the exchange of ideas, the intermixing of cultures, and the mutual fascination of different peoples. Ancient religions – This gallery focuses on religious depictions and ritual artifacts that demonstrate the spread of religion throughout Asia. In particular, you’ll learn how the faiths of India influenced those of China and beyond through trade. Pulau Ubin is an island located between Malaysia and mainland Singapore. Since the island is relatively undeveloped, it’s a great place for couples who love nature. You’ll also have the rare opportunity to see a traditional kampong village here. Head to Pulau Ubin to escape from the pandemonium of metropolitan Singapore. What should you expect at Pulau Ubin? Credit cards are not accepted – Pulau Ubin has stayed quite isolated from the modernization of mainland Singapore. Businesses on the island work on a cash-only system, and there will be no ATM machines available. Be sure to bring plenty of cash on your visit here. Life here is slow – You won’t find any bustling shopping centers or futuristic skyscrapers here. Rather, you’ll find a small rural community reminiscent of simpler times. Visitors to Pulau Ubin come to seek peace and quiet, not action and excitement. 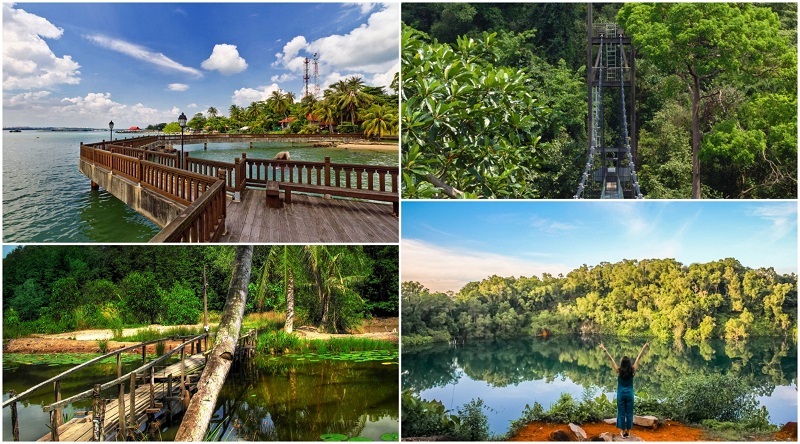 The Chek Jawa Wetlands are a must see – The Chek Jawa Wetlands are Pulau Ubin’s main attraction. This virtually untouched area features gorgeous scenery and a vibrant ecosystem. Mount Faber is a popular outdoor attraction located in central Singapore. Couples flock to the hill to explore its trails and to catch the Singapore Cable Car to Sentosa Island. Take a break from the bustling city streets, get some fresh air, and take in the fantastic view of Singapore’s central business district on Mount Faber. What activities can you enjoy at Mount Faber? 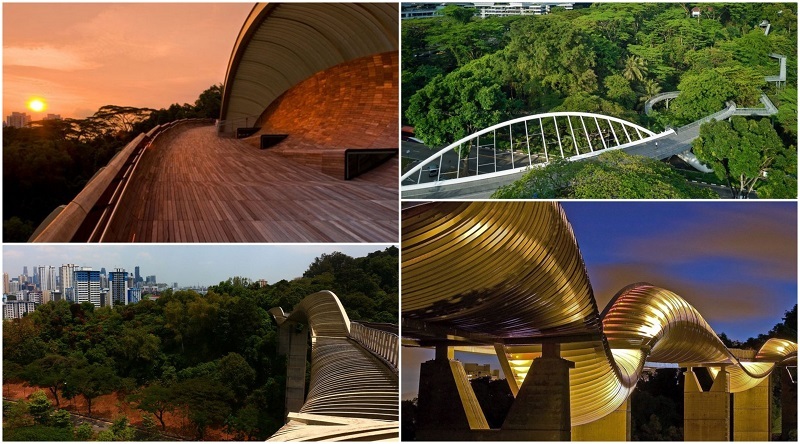 Guided tours – Take a guided tour along the nature walks of Mount Faber. Several options from different companies are available. For instance, the national parks service of Singapore offers the Southern Ridges Guided Walk, which starts at Mount Faber Park. What better way to learn about the history and nature of Singapore than from an informative guide? Bird watching – Mount Faber is a great spot for bird watching, as the area is home to at least 43 species. Look out for bird watching workshops, which are occasionally organized by park staff. Hiking –Mount Faber is a fantastic place for hikers to visit. Climb to the top of Mount Faber for panoramic views of the city, or take on the entirety of the Southern Ridges on a daylong romantic outing. The Southern Ridges is a trail that connects Mount Faber Park, Telok Blangah Hill Park, and Kent Ridge Park. Along the way you’ll find numerous buildings, bridges, and landmarks. Cherish the tranquillity and greenery of the parks with your partner while you wander through one of Singapore’s most cherished trails. What should you know about hiking the Southern Ridges? Consider the trail length – Keep in mind that the trail in its entirety is 10 kilometers. To hike this distance from start to finish could take anywhere between two to four hours, depending on the hiker. Plan ahead so you have sufficient time to complete the trail, or opt for one or two segments. Visit the war museum in Kent Ridge Park – Stop by Reflections at Bukit Chandu during your walk. You’ll see some interesting wartime monuments and artifacts here. 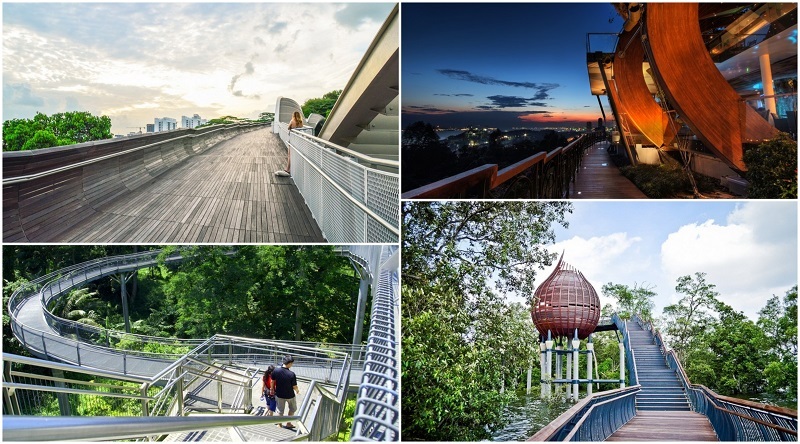 Don’t miss the Treetop Walk – The Treetop Walk, which can be found near the MacRitchie Reservoir, is an elevated walkway that leads through the forest canopy. You’ll feel at one with nature as you immerse yourself in the greenery of the treetops. Kampong Glam is a lively neighborhood located to the north of the Marina. The area is referred to as the “Muslim Quarter” due to the presence of a large Muslim community here. You’ll realize this quite quickly as you notice the Middle Eastern inspired architecture and storefronts. Get to know the Muslim culture in Singapore at Kampong Glam. What can couples see at Kampong Glam? Local street art – Kampong Glam is a popular area for couples to look for street art. Walls of streets like Victoria Street and Aiwal Street are adorned with colorful murals. Many of these are commissioned pieces by local artists and depict various aspects of Arabic culture. Distinctive architecture – The beautiful architecture of the buildings here hint to the area’s link to Middle Eastern culture. You’ll see this influence in simple landmarks like Sultan Gate, or in large-scale buildings like Sultan Mosque. Culinary delights – In addition to Middle Eastern food, you’ll find flavors from all over the world in Kampong Glam. Try Indonesian-Thai fusion at Bumbu, or go for the classic Kampong Glam meal at Kampong Glam Café. Shopping – The streets of Kampong Glam are teeming with trendy shops where you can stock up on souvenirs, textiles, jewelry, and local artisanal goods. Try Haji Lane or Arab Street to start. On the edge of Orchard Road you will find the Singapore Botanic Gardens, the only tropical garden to be named a UNESCO World Heritage Site. The gardens host over 10,000 species of plants, which are complemented by charming arrangements of lakes, lawns, and streams. Couples can spend a romantic a day taking in the sights and smells of one of the most beautiful gardens in the world at the Singapore Botanic Gardens. 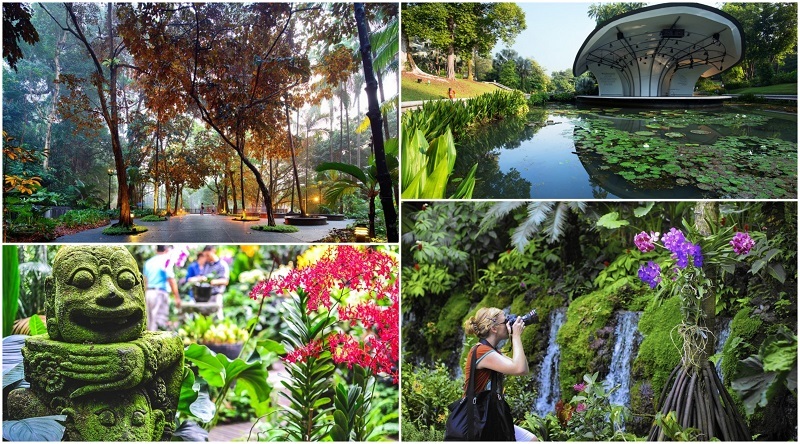 What plants and flowers can you expect to see at Singapore Botanic Gardens? National Orchid Garden – The National Orchid Garden is the centerpiece of Singapore Botanic Gardens. This blooming garden is home to over 1,000 species of orchids, many of which were bred right here at the Singapore Botanic Gardens. A walk among these brilliant flowers is not to be missed. Rainforest – In this mini rainforest you will find 314 species of trees, ferns, and shrubs. Some of the trees here are hundreds of years old, while other plants hold great economic importance. Come wonder at these green giants at the Singapore Botanic Gardens Rainforest. Ginger Garden – The Ginger Garden is a one-hectare area consisting of over 250 species of ginger plants. This garden is organized by region and borrows some of its beauty from the pond and lake located within. The incredibly diverse shapes and gorgeous flowers of the ginger plants will inspire awe among all. Bask in the splendor of the beautiful orchids at the National Orchid Garden. As you enjoy a romantic walk along the paths of the garden, you’ll encounter lush green tunnels and the vibrant colors of over 1000 species of orchid. Charming statues and fountains complement the verdure, creating an idyllic backdrop for a peaceful stroll. 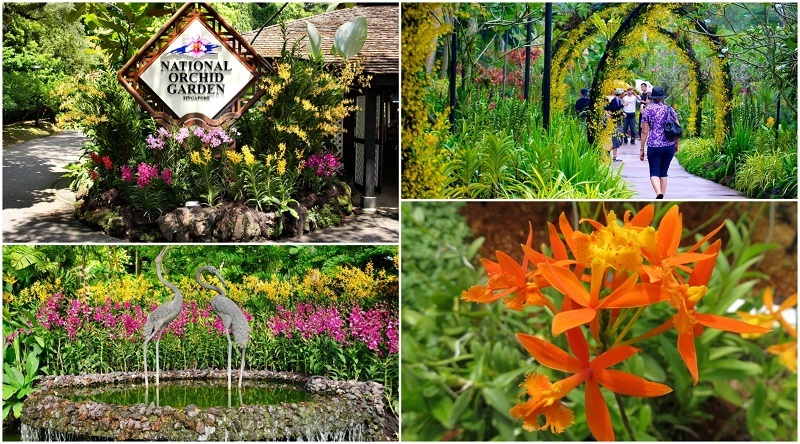 Don’t miss the National Orchid Garden, located at the Singapore Botanic Gardens! What are the four “zones” at National Orchid Garden? Spring – The colors of this zone evoke the feelings of excitement that comes with the first signs of spring. Orchids here come in bright shades of yellow and gold. Summer – This zone uses warmer tones to conjure the sense of basking in the summer heat. You’ll find deep reds and pinks here. Autumn – The orchids in the autumn zone come in more muted shades of orange and green. These colors mimic those of the changing autumn leaves. Winter – The winter zone features white, blue, and purple orchids. These cool colors represent the frost and snow of wintertime. Singapore Zoo is a park run by the mighty Wildlife Reserves Singapore. 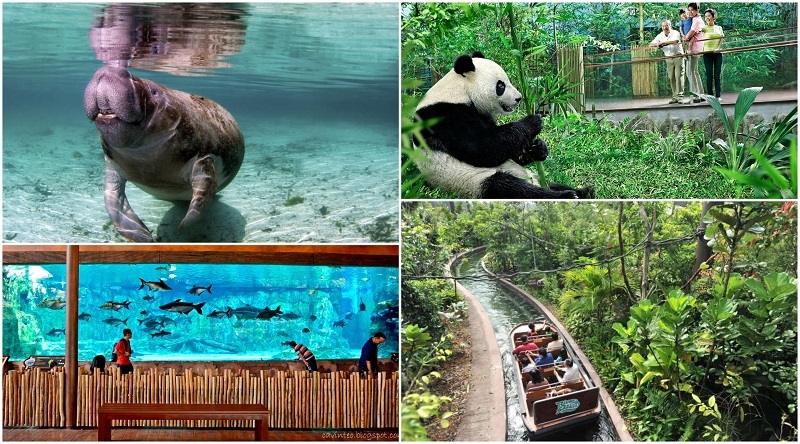 Like other attractions operated by the organization, Singapore Zoo dedicates itself to offering visitors an expansive collection of exhibits, daily educational shows, and opportunities to interact with friendly animals. Enjoy a romantic walk around Singapore Zoo and take advantage of all the photo opportunities with wild animals. Why should you visit the Singapore Zoo? See an extremely rare species – Singapore Zoo takes pride in successfully breeding and housing several endangered species. These species include the White Rhinoceros, Gray Langur, and even the legendary White Tiger. Dine with Orangutans – You won’t want to miss Jungle Breakfast, one of the Zoo’s most popular activities. Sit down to a freshly prepared breakfast while the zoo’s charming residents come to greet you. If you are feeling brave, the keeper will even let you get up close with the animals for a picture. 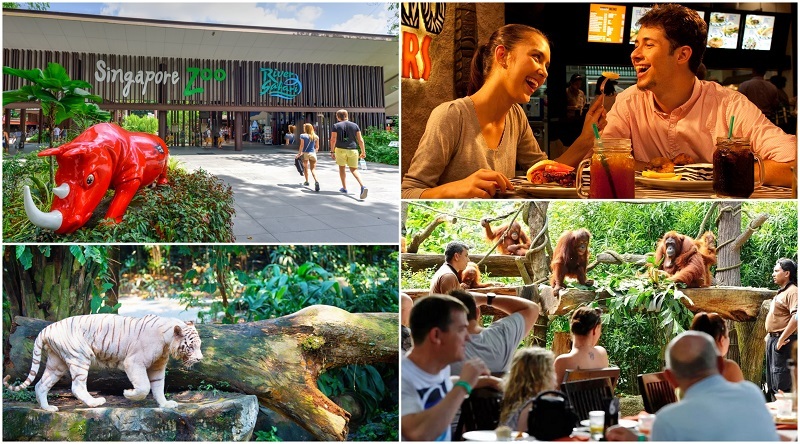 Enjoy the exhibits guilt-free – Singapore Zoo works to keep their habitats as naturalistic as possible. Many animals are allowed free range within large enclosures, giving the sense that they never left the wild. You are free to observe the animals without being weighed down by the thought of inhumane enclosures. See the workings of a river ecosystem at this zoo and aquarium. Located between the Singapore Zoo and Night Safari, River Safari is inspired by the world’s most famous rivers. Exhibits include the Ganges River, Yangtze River, and Mississippi River. The park hosts up to 5000 animals from 300 distinct species. These creatures can be seen through River Safari’s various exhibits, shows, and rides. Being the first park of its kind in Asia, River Safari is sure to please any couple on their first date. What can couples expect at River Safari? See the animals rain or shine – If rain has put a damper on your plans to visit the Zoo, take refuge at River Safari. The exhibits here are either indoors or topped with a roof, so you can expect to see the animals regardless of weather. Be patient – Remember that many creatures instinctually hide from predators or blend into their surroundings. Be patient when looking for the animals, especially while on the Amazon River Quest boat ride. Get to know the animals – While many animals are shy, River Safari is home to plenty of friendly ones. River Safari offers opportunities to meet and feed their residents. See their website for the full list of programs. Be ready to float – River Safari offers two floating rides: Amazon River Quest and Reservoir Cruise. Take advantage of the chance to catch the scenes and see the animals from a different vantage point. A walk through Night Safari is the perfect way to end a day at the Singapore Zoo next door. The park, which opens after sundown, allows its animals to live by their natural day-night cycle. 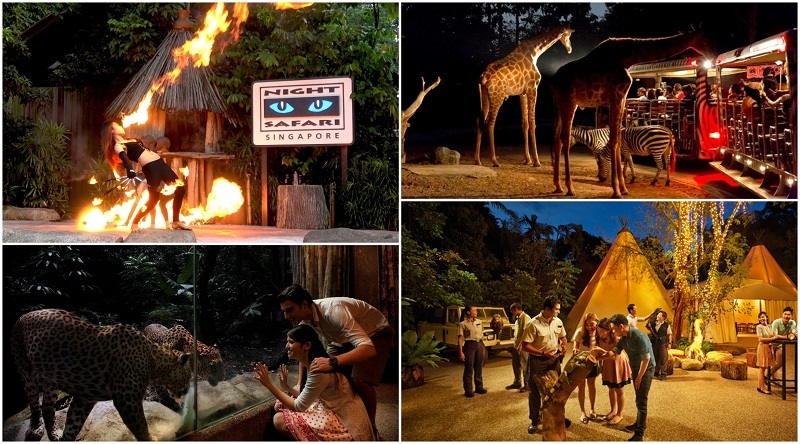 Being the world’s first “nocturnal zoo,” Night Safari is one of the most popular attractions for couples in Singapore. Get in on the hype and come face to face with nighttime critters in their natural state here. How can you make the most out of your visit to Night Safari? Don’t bother bringing your camera – Night Safari prohibits flash photography, so whatever pictures you take will be too dark. Even if you do decide to break the rules and use a flash, the only image you will be capturing are of startled and angry animals. Catch the night shows – Night Safari puts on two wonderful shows – a fire throwing performance and a “Creatures of the Night” show. Double check the schedule and plan your visit to the park accordingly if you want to catch a show. Learn from your guide – Some residents of Night Safari can only be seen in certain “hidden” locations. Book a wildlife tour and a guide will take you on a buggy ride through selected areas. Listen closely as your guide tells you little known facts and answers your questions about the creatures here. 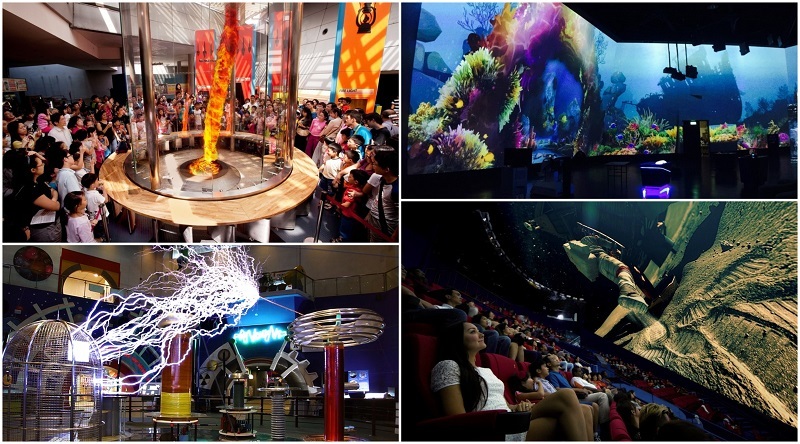 Science Centre Singapore is an interactive learning experience complete with hands-on activities, live shows, and engaging exhibits. The museum displays scientific concepts in vibrant, exciting ways that are rarely seen at other museums. For couples who want a fun day out, visit the Science Centre and test each other through a variety of interactive exhibits. What should you look for at Science Centre Singapore? Learn about the local foliage – Visit the Ecogarden to see common flora and fauna in their natural state. The garden is left as is and only receives special care when needed. This makes the Ecogarden the perfect place to immerse yourself in nature. Shows and Demonstrations – Don’t miss the Fire Tornado demonstration where a funnel of hot fire spirals into a twister inside a safety tube for visitors to see. Also catch the Tesla Coil show where blasts of electricity lights up the arena. Appreciate Singaporean inventions – It’s no surprise that an innovative country like Singapore cultivates important inventions. This exhibit, titled “Singapore Innovations,” documents how several Singaporean inventions came to leave their mark on the world. Located next door to the Science Centre, Snow City is an indoor snow centre where you can toboggan down a sloped hill on a cushy tyre. With Singapore’s constant humidity and sunny weather, this could be the perfect place to cool off. Couples can snuggle up to keep warm or have a fun snow ball fight during the 2 hour visit. 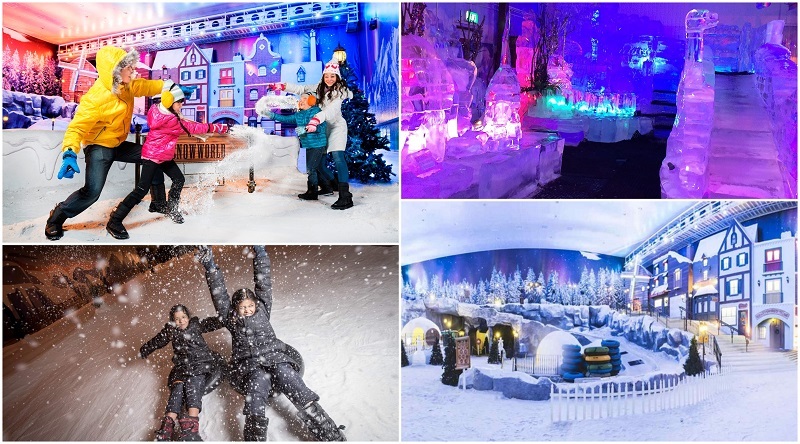 What can couples do at Snow City? Snow Slide – Slide down a snow hill on a tyre as many times as you want in a . Ice Sculptures – Various uniquely designed ice sculptures are placed near the entrance for visitors to admire. Enjoy the snow – Singapore is always hot, so you’re not going to find a better opportunity to play with snow than here. The Mint Museum of Toys displays a private collection of vintage toys. Featured items include action figures, soft toys, and collectible items. Many of these pieces are extremely rare and in mint condition. This extensive selection of antique toys not only brings out the child within visitors, but also acts as important relics of times past. Why should you visit the Mint Museum of Toys? Couples can revisit their childhood – Reconnect with old times as you discover the long-forgotten toys of your childhood. Even if you never owned any of the items on display, their old-timey feel will bring about a wave of memories and nostalgia. Thousands of toys – With up to 8,000 items on display and themes ranging from superheroes to animation, the Mint Museum of Toys is every toy fan’s dream museum. Everyone will learn through toys – Like most artefacts of culture, toys reflect the sociopolitical climate of the time in which they were produced. The informative descriptions accompanying each exhibit provide a brief history lesson and provide an insight into our societies in a thought-provoking manner. 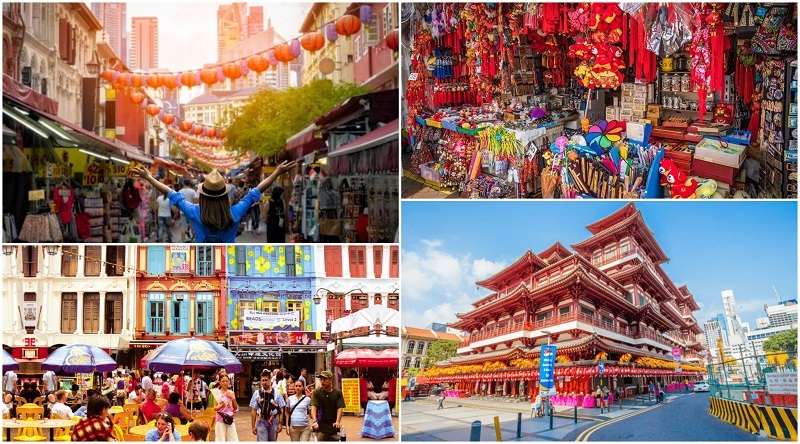 Singapore’s Chinatown has a huge variety of shops, restaurants and attractions to visit. It’s a casual day out for couples who choose to explore Chinatown and there’ll be plenty to see and experience. You can even join tours to get a deeper understanding of Singapore traditions and way of life. What can couples do at Chinatown? Shopping – browse through the alleys and pickup some bargain souvenirs, shoes or clothes. 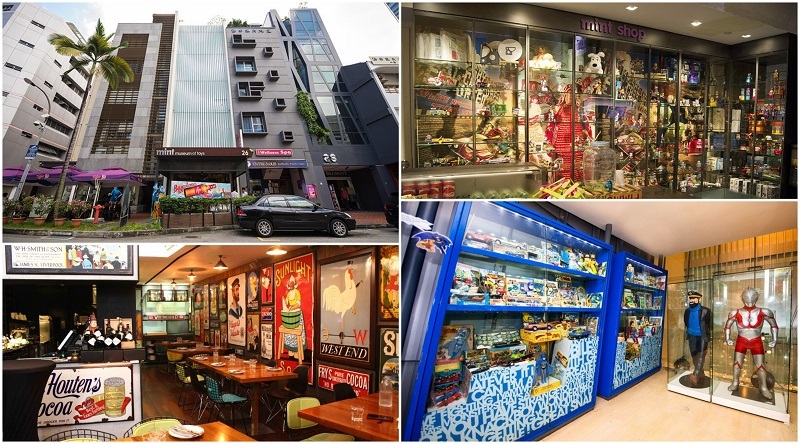 Restaurants – Try Singapore’s chilli crab or grab a traditional sweet dessert to keep you going for the day. Temples – Don’t miss the four story high Buddha Temple and museum or the Sri Mariamman Temple. 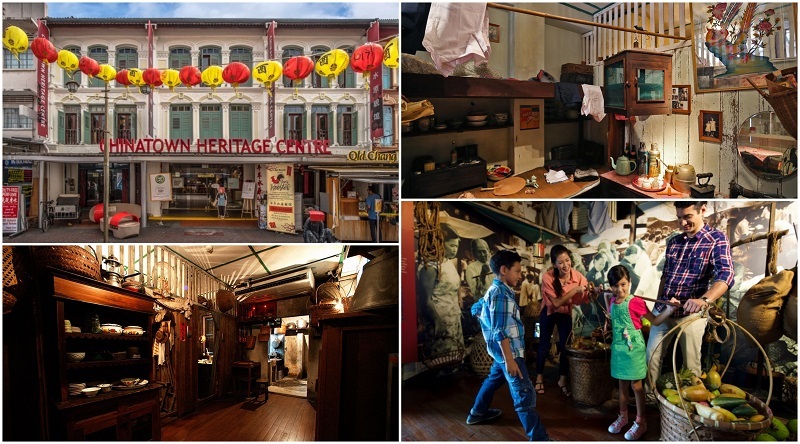 Chinatown Heritage Centre – Learn about the history of Chinatown and it’s origins. This interactive museum delves into the lives of Chinatown’s first residents. Chinatown Heritage Centre plays an important role in educating visitors about the history of one of the country’s largest communities. If you are looking to better understand the legacy of Singapore’s Chinese community, Chinatown Heritage Centre is the place to go. Why should you visit Chinatown Heritage Centre? Learn the story of Singapore’s Chinese immigrants – Chinatown Heritage Centre tells the story of how Singapore’s Chinese immigrants came to Singapore. The museum also illustrates the lives and hardships of Chinatown’s earliest residents. Visit recently renovated exhibits – The museum has recently been renovated and updated. It now includes the narrative of post 1960’s Chinatown, and exhibits have a new, refreshed look. Be captivated by masterful storytelling – The center makes use of special effects to create a convincing depiction of early Chinatown. You’ll be transported into the lives of early Chinese immigrants by the sights, sounds, and smells of the exhibits. 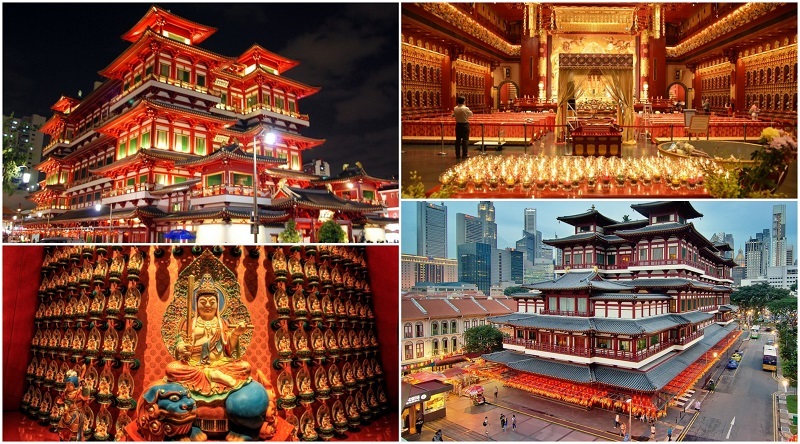 Buddha Tooth Relic Temple & Museum is a temple-museum complex found in Singapore Chinatown. This impressive building, designed in the style of Tang Dynasty architecture, is four stories tall and houses a multitude of exhibits. Walk through the gaudy red and gold rooms to learn about Buddhist culture and see some of this community’s precious artifacts. Budda Tooth Relic Temple & Museum is a shining example of Singapore’s celebration of cultural heritage. What are some highlights of Buddha Tooth Relic Temple & Museum? See the Buddha’s artifacts – The temple complex was primarily built to house the Buddha tooth relic. This relic is said to have been taken from the funeral pyre after the Buddha was cremated. Other artifacts and items can be found within the temple’s exhibits. Spin the prayer wheel – The prayer wheel is located on the top floor of the complex. This wheel, covered in intricately painted prayers, is the largest Buddhist prayer wheel in the world. Spin the wheel clockwise to activate the prayers. Take a tour – The Buddha Tooth Relic Temple & Museums offers free tours to visitors once a week. Knowledgeable volunteers lead you through each room while providing fascinating information about the temple and the Buddhist culture. 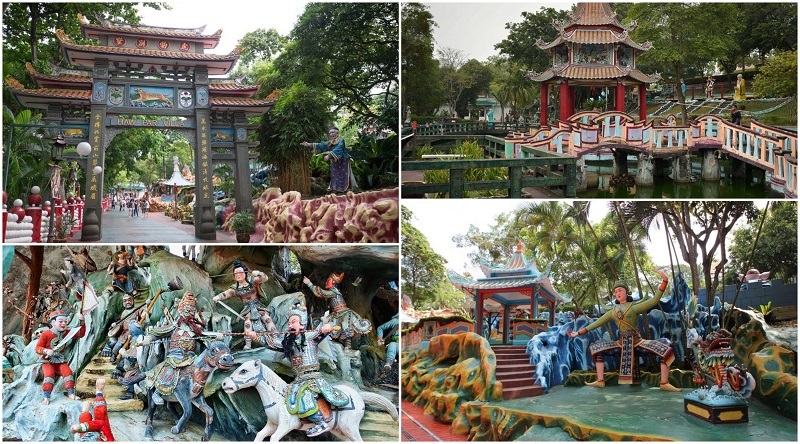 Haw Par Villa is a theme park located near the Queenstown area. The park is the world’s only “Asian cultural park” and focuses on Chinese mythology, history, and philosophy. Couples can marvel at the wacky statues and huge installations that portray various scenes from East Asian folklore. A visit to the eccentric Haw Par Villa is sure to be an interesting romantic night out. What are the must see exhibits at Haw Par Villa? Ten Courts of Hell – Don’t miss the controversial diorama known as the Ten Courts of Hell. These gruesome scenes depict sinners being punished in the afterlife. Each court represents a specific crime with their corresponding punishment. Be warned – these scenes are quite graphic. Vices & Virtues – Another popular diorama is Vices & Virtues. The statues here illustrate Confucian lessons on vices, like laziness, and virtues, like humility. Get some insight on traditional Chinese moral code here. Journey to the West – This diorama is a monument to the classical Chinese novel titled “Journey to the West.” The story follows a monk’s Westward pilgrimage and is an important piece of East Asian folklore. This amusing exhibit is as educational as it is entertaining. 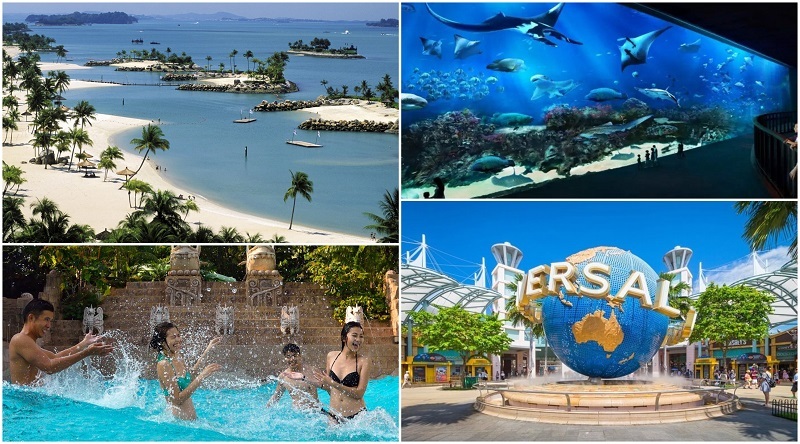 Sentosa Island is one of the best tourist areas to visit for couples who want an endless fun. You won’t be able to cover all the attractions in one day, so you could potentially plan a whole weekend (or more days) for a romantic time. It might even be worth booking a hotel for a night, enjoy each other’s company, before exploring more of Sentosa the next day. Which attractions are best for couples at Sentosa? Universal Studios – with numerous rides, shows and photo opportunities, a visit to Universal Studios will definitely provide fun for the whole day. S.E.A Aquarium – spend half the day in awe as you see marine life in some of the biggest tanks in the world. Learn more about Singpore’s history at the maritime experiential museum, which is part of the S.E.A Aquarium entry fee. Adventure Cove – Splash around in the various pools available or test your nerves on some of the wild water rides. There’s also a relaxing lazy river if you prefer a quiet chat while floating in the water, or hold hands in the rainbow reef, watching colourful fish swim by. More attractions – If you want to see what else is on at Sentosa, have a look at our article on 17 Fun Things to do in Sentosa. 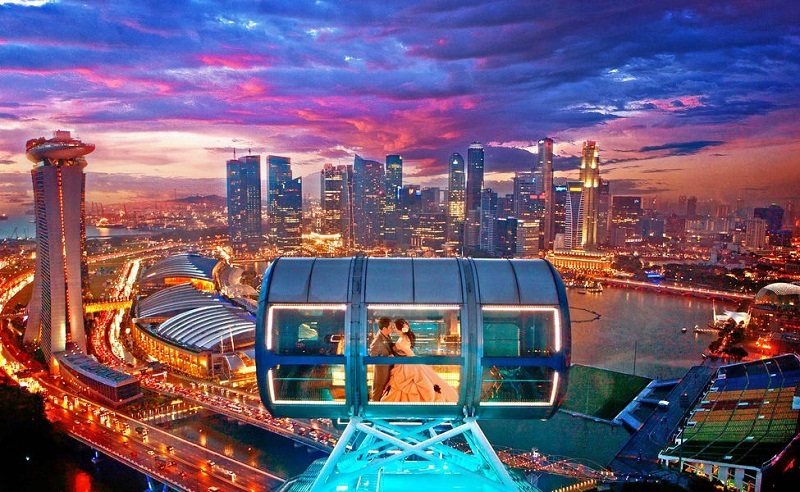 There are many more attractions, activities and things to do for couples in Singapore. If these suggestions were not suitable, have a look at other options and plan a romantic day with your partner.